How will 9B project help Race Track Road traffic? 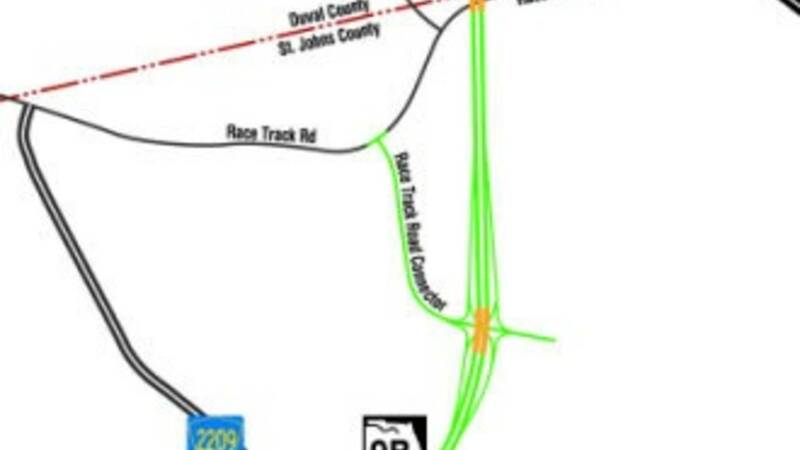 JACKSONVILLE, Fla. - Many drivers describe the stretch of Race Track Road on the Duval County-St. Johns County border as a "traffic nightmare," and several new developments are in the works that will only draw more travelers to the area. Traffic has become a huge issue along the stretch of two lanes from Bartram Springs to Durbin Creek, and several organizations, including the First Coast Metropolitan Planning Organization and the Florida Department of Transportation, have a plan to help alleviate congestion. "Our planners and our developers, they're looking ahead at what the growth is going to be years in advance and looking at purchasing right of way as we look at development in these areas," FDOT spokesman Ron Tittle said. "I don't know that we can build ourselves out of congestion, so there's got to be creative ways." State Road 9B will extend from Interstate 295 near Baymeadows Road in Duval County to St. Johns Parkway in St. Johns County. Phase III (pictured) will be a four-lane road that runs from St. Johns Parkway to just north of Race Track Road. Phase III of 9B is federally funded at nearly $80 million. Construction will begin this fall on St. Johns Parkway just north of Liberty Pines Academy and is expected to be completed by mid-2018. When it is completed, the name will be changed to Interstate 795. "We're going to do overpasses near that school because we want to minimize congestion around that school," Tittle said. "Where Race Track currently is, we're going to be putting an interchange or ramps to get onto I-95 because of safety issues. That's why we moved the ramps back further and put up ramps for Race Track itself." As for the possibility of widening Race Track Road, no projects are in the works, but Tittle said it might not be necessary. "The interpretation is that with all of the work we're doing now with the future I-795, that that in itself will alleviate a lot of congestion," he said. FDOT plans to hold another public meeting on Phase III of 9B sometime before construction begins. For more information on the project or the time and location of the meeting once it's scheduled, go to www.dot.state.fl.us.